I had some reservations about being asked to review this book for The Irish Story. While I would spend a great deal of my time reading and researching the history of Irish Republicanism I would tend to focus on the 1913 -1923 period and shy away from books dealing with the modern ‘troubles’ in the North except perhaps for more general histories. Having seen Mr. Oppenheimer’s book some months ago my first impression was that it would be too modern a period, and too specific a subject to hold my interest – however I must admit to being wrong on both these counts. At first glance the book seems daunting to any reader – (quite a large volume at 364 pages apparently detailing with forensic detail the ballistic and military capabilities of the Provisional IRA) – however once you start reading the book the author quickly makes clear that he does not intend to take you on “an anorak journey of bomb technologies and tactics only” – and he remains largely true to that promise. If you have an interest in Northern politics, Irish republicanism or have read and enjoyed such classics as: The IRA by Tim Pat Coogan, The Dirty War by Martin Dillon or A Secret History of The IRA by Ed Moloney then this book is a must. The author is an acknowledged explosives and weapons expert and writes for Jane’s Defence Weekly. However far from being strictly a ‘military man’ his book offers an astute and insightful account of northern politics. The historical and political commentary and overview in the first two chapters of the book is precise, accurate detailed and balanced without becoming dull, or boring the reader. Oppenheimer has an interesting writing style using sharp, dry wit and humour where appropriate to break up the very serious subject matter. The book contains much more than just statistical information about modern guerrilla warfare giving insight into military strategy, political negotiation, snippets of earlier history about Fenian bombing campaigns and republican politics. Added to this are the personal stories of the bombers, victims, eyewitnesses and bomb disposal officers who encountered such machinations of death. In Chapter Three – ‘Spectaculars. We have only to be Lucky Once’ Oppenheimer recounts with detail the daring risks, drama, resourcefulness and political impact of events such as the Brighton Bombing, Canary Wharf and the IRA mortar attack on Downing Street without ever loosing sight of those who were killed, devastated by the loss of loved ones, or left suffering horrendous injuries by such attacks. Throughout the book Oppenheimer, while marvelling at the creativity and ingenuity of IRA attacks, manages never to glamourise or romanticise the grizzly stock and trade of the bombers. Nor does he distance their actions from the wider context of violence and politics in the north and forget to ask what drove ordinary people to commit such desperate acts. Through interviews with former IRA bomb makers in Chapter Eight – ‘If You Hit A Target There Was Elation’ Oppenheimer offers a fascinating insight into the mind of men and women who felt compelled to plan, instigate and carry out such attacks. Of particular interest are his interviews in this chapter with Marian Price, Patrick Magee and Shane Doherty where he questions the former bomb makers about their motivations, the impact of their actions and whether they feel any remorse. Without losing the political neutrality of the work or the interest of the reader in the following chapter Oppenheimer reflects the views of the members of the Bomb Disposal Units and British Security Forces who were forced to deal with and disarm such devices. Unsurprisingly given the serious nature of the subject the book can make heavy reading in places and at times the sheer wealth of detail, facts, figures and information supplied by the author can take time to absorb. The wealth of research and analysis that have obviously gone into the volume, make it a book for serious study rather than casual reading – not something that you can dip in and out of during a short trip on public transport but rather a book the reader should make time for to get the full benefit of Oppenheimer’s work – so maybe a long flight or train journey? However, only in chapter Five – ‘Explosives. From Gunpowder to Magic Marble’ does the author let his knowledge of science and chemistry get in the way of the narrative. Otherwise the book is clearly written, largely avoids ‘jargon’ and will be of particular interest to anyone interested in the politics of the Northern Peace Process, the ‘Troubles’ and the history of militant Irish Republicanism. 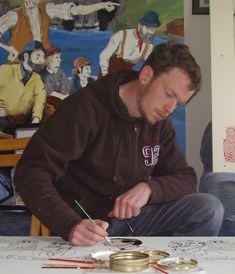 Pádraig Óg Ó Ruairc is originally from Co. Clare but now lives in Cork. He works seasonally for the Irish Heritage Service at Fort Charles in Kinsale and is currently researching the Anglo-Irish Truce for a Ph D in the University of Limerick. He is the author of Blood On The Banner and The Battle For Limerick City. He is the administrator for the website www.warofindependence.net a resource page dedicated to making public new research about the War of Independence in Clare and Galway. Written by: PadraigOgORuairc on 21 May, 2010. Last revised by: John_Dorney20 November, 2010. 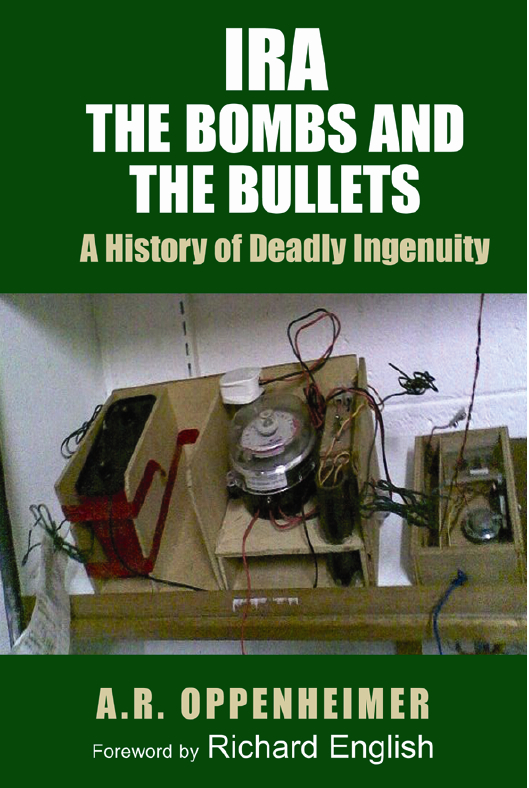 One Response to "Book Review ~ IRA The Bombs And The Bullets: A History of Deadly Ingenuity ~ A.R. Oppenheimer"